Thurston Huntting “Hunt” Smith and Samuel Foucher are proud recipients of a 2013-14 Traditional Arts Apprenticeship grant from the New Hampshire State Council on the Arts. Hunt has over forty years experience in the fine and decorative arts, and has been making violins and violas at his home in Nelson for several years. Samuel is a recent recipient of the Johnny Trombley Scholarship from the Monadnock Folklore Society as a contra dance musician, studying under the great Bob McQuillen. For the past year, Samuel and Hunt have met regularly as part of Samuel’s home-schooling to learn fine woodworking skills. 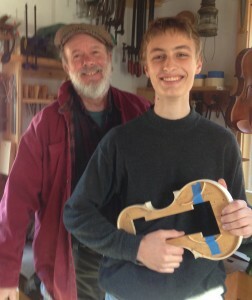 Now his plan under the apprenticeship is to make a violin of his own! Upon completion of the project, Samuel and Hunt will make a public presentation at the Harrisville Public Library. The Nelson Town Hall has been the center of town life for more than 150 years. In 2014, we expect the supporting structure of the hall to be renovated and repaired. The hall will be closed for a period of time, and we are currently looking for a temporary location for the MFS events, including the Monday contra dance, during the summer of 2014. Send your ideas to lsievert@yahoo.com. As background, here is a link to recent research that has been done into the history of our beloved hall. David Kaynor, caller and fiddler, with Sarah and Samuel Foucher, this year’s Trombly Scholarship winners, led dances at Peterborough’s South Meadow School in early April. 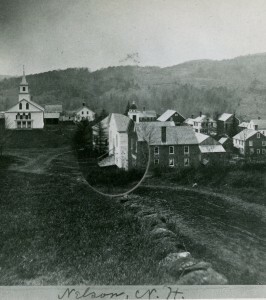 Over the summer, Bob McQuillen was the subject of a Monadnock Lyceum session in Peterborough. 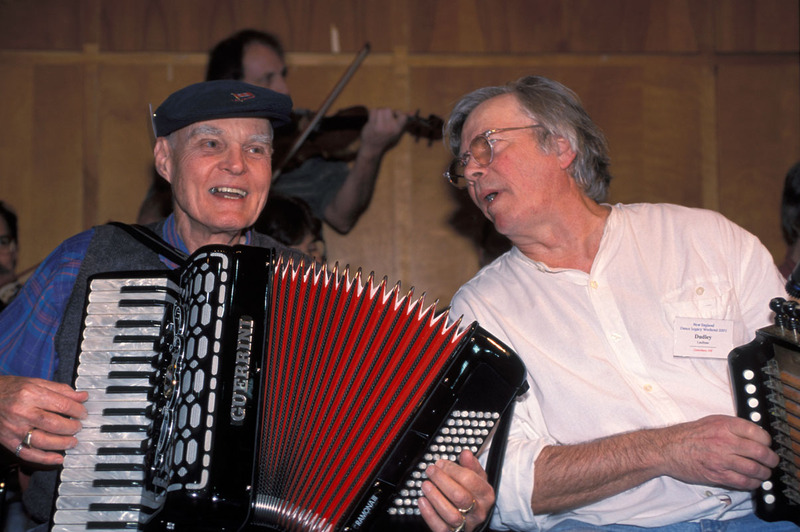 A Celebration of New England Contra Dance Music: Honoring Bob McQuillen_Last Segment from Gordon Peery on Vimeo. On Sunday, July 15, a Monadnock Lyceum was held at the Unitarian Church in Peterboro, NH. All the pews were full for the event, a presentation of Monadnock Region music, particularly square and contra dance music, and Bob McQuillen’s part in it, which has been and still is big. Gordon Peery of Nelson and the Monadnock Folk Lore Society put the show together. Gordon gave a good talk on the history of contra and social dancing . Then Old New England, Bob Mcquillen’s band, himself, Jane Orzechowski, and Deanna Stiles, on flute, fiddles and piano, played some selections of jigs, reels, hornpipes, marches and waltzes, some of them Bob’s own compositions. In the balcony, thirty musicians, all influenced by Bob, or, even influenced him, waited for the four potatoes, and, playing Jimmy Allen in unison on fiddles, accordions, concertinas, banjos and flutes, they processed, youngest first, oldest (me) last down the stairs and up the aisle to fan out across the alter. Then they played Amelia’s Waltz, on DDog. with steel gray hair, bribing the bellows. weather brown barns, evergreen tree. you can hear it out in the parking lot. Soon it was haunting my thoughts and my dreams. To write this ridiculous annual spree. “Just great!” I assure them, sincerity flowing. A family party the day of the show! And scan the right rhythm, for most of the time? Will the audience laugh? Will the swords ever lock? Will the hero lie there with a hole in his sock? Yes , they will, yes we can, yes we did, it was fun! And now I can file this son-of-a-gun! Despite all the worries that come with the task. And now to relax, celebrate with good cheer! I wish you good Solstice, and happy New Year! We are working on getting a benefit concert together for affected area families and businesses now. Have a look at what our little 8″ deep brook turned into on Sunday, August 28, 2011 and if you have even a little extra to share, consider a donation of any size to the local Red Cross chapters here in Vermont. Please pass the word. We’re all doing what we can to help out. Your help will be much appreciated, as well. When I heard that Bill Morrissey had died July 23, I was stricken with grief and felt a void in my heart. The idea that I’d never again be able to venture up that great hill in Newmarket, to the top of those stairs and through those burly wooden doors to see Bill on the Stone Church stage singing his songs was a feeling I couldn’t seem to digest. Probably never will. The most important action you can take now is to contact your State Senator-before May 10-to let him or her know HOW IMPORTANT THE ARTS ARE TO NEW HAMPSHIRE and our economy. NH Citizens for the Arts is asking the Senate to restore the Governor’s budget recommendation for the Council, $427,555 (which already incorporates a cut of almost 7% over the current year’s budget). Background: Now is the time for you to be in touch with your Senator on behalf of the Arts Council! As you know, the House budget bill, HB1, left only $4700 in the Council’s budget, obviously not enough to maintain any semblance of an agency; in its budget attachment, HB2, the House completely eliminated the Arts Council and dispersed the Dept. of Cultural Resources. We have heard that the Senate is not likely to consider HB2 at this time, but they are still dealing with a House Budget that defunds the Council. Data: We all know reasons why restoring state support for the arts is vitally important. For the statewide impact, the Arts Council has clear new data posted on its web site at www.nh.gov/nharts. Click on Arts Budget Update and Art Matters on the Home Page (the new NHSCA Agency Profile is especially helpful). Please spend a few minutes with this information-it’s important that we get our facts straight. Contact: The best contact with your Senator would be in a face to face conversation. Next best is an actual letter (on paper!) and next is a phone call. Many Senators are getting so much email that either their accounts are overloaded or they have stopped reading it. In any event, you should contact them as a constituent, with specific examples about how losing the Arts Council will hurt your community and region. If you write your Senator, please send a copy of your letter to the whole Senate Finance Committee, listed below. Email can be addressed via the Committee aide, Shannon Whitehead, at shannon.whitehead@leg.state.nh.us with “For the Senate Finance Committee” in the subject line. Her phone # is 271-4980, and she may be helpful in making an appointment with a member of the Finance Committee. An important argument: At this point in their Budget deliberations, the Senate Finance Committee is going to be making a lot of trade-offs. Here is one very important argument you can make: Without State funding for the Arts Council, there may be more than $850,000 in federal money lost to New Hampshire. These are our tax dollars that we have already paid for. Among other things, this money improves education in New Hampshire. There is no reason that some other state should get this money. Please help New Hampshire Citizens for the Arts (http://www.nhcfa.org/) to fight for arts funding in New Hampshire. More information about the NH State Council on the Arts at http://www.nh.gov/nharts.